A lightsaber listed as Luke Skywalker's weapon from the original Star Wars film has been pulled from auction over doubts about its origin. Los Angeles auctioneer Profiles in History said it had cancelled the sale due to "conflicting information". The item was described as one of five weapons designed by Oscar-winning set designer Roger Christian for actor Mark Hamill in the 1977 film. But fans and bloggers raised questions about the prop online. 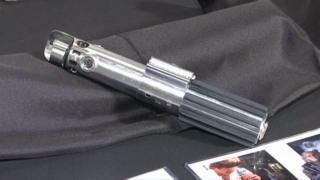 The lightsaber was expected to sell for up to $200,000 (£157,000). In a statement reported by Reuters, Profiles in History chief executive Joe Maddalena said they had cancelled the sale of the weapon "in light of conflicting information" about its origin. Mr Maddalena said they would not put it back up for auction "until Mr Christian can clear up the inconsistencies that have been brought to our attention". It had been listed as a lot in the Blockbuster Hollywood Treasures auction, due to take place between 11-14 December. Mr Christian had provided a letter of authenticity with the iconic item. However, the Original Prop Blog posted a series of videos raising doubts about the weapon, including alleged discrepancies between the lightsaber shown in that letter and the lightsaber in the auction catalogue. But Mr Roger Christian told the BBC it was one of five original lightsabers made for the film, saying: "It is real - I've got the Oscar to prove it." The Academy Award-winner said the film's low budget meant he was putting together lots of different elements to make the props, meaning all of them were unique. "I was supergluing things together - they all look different." The dispute comes a week after Luke Skywalker actor Mark Hamill tweeted about the auction, warning fans the lightsaber may not be a one-off. "Be Advised," the actor wrote, "There was no ONE lightsaber I used in the films, but many, MANY, both for myself & my stunt-double." He ended the tweet with the hashtag, #BuyerBeware.